Lenox Tableware - Founded 1889 Trenton, New Jersey by Walter Scott Lenox. Walter had the gift of creativity mixed with business acumen. He did a really good job when he founded Lenox china. What strategies did he implement? A young artist-potter, Lenox founded the works with a view from the very outset to create an ‘art studio’ atmosphere. 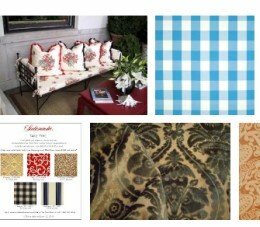 He gathered around him many like-minded and talented designers and artisans. In 1918 they were the first American company to create the official state table service for the White House and also had the honor of being the first American antique bone china company to exhibit at the National Museum of Ceramics, in Sevres, France. 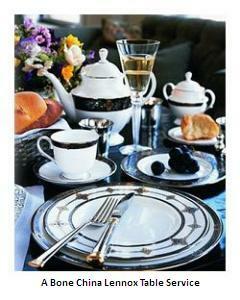 Lenox is now the only major producer of fine bone china in the United States. Their plant is located at Kinston, North Carolina, and covers over 40 acres of land. 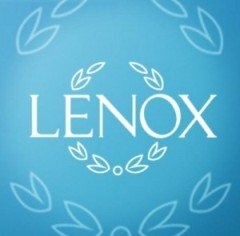 Lenox Corporation today, as far as I can see, at time of writing (October 2012) is still apparently going strong and marketing wares some of which, I read, were still being made in America. The reason I hesitate is most of the top English bone china brands went into administration in the latter part of the 2000's and much of their wares are now oursourced in the Far East. The brands themselves are just puppet playthings of bigger groups. The old English factories are all but shells and the workers gone. The slogan of the new Lenox Corporation is "American by Design". What that seems to imply, or at least the way my cynical mind interprets that statement is, "OK, we are an old respected American company and we design everything here and we have a huge plant in Kingston, but don't be surprised if we also outsource a great deal the the Far East too". Which is fine as long as everything is clearly labelled. Customers and collectors have a right to know, as this is a major influencer of purchasing decisions for many people. If you get the impression I am a campaigner for clear labelling, I am - I have have fought battles with the English majors on this and, as a designer of product for them, it has nearly cost me my livelihood (I had to start my own rival company in the end). I know that one of Lenox's brands, Gorham, makes in the Far East. How do I know? I have seen it written on the backstamp. Which is more than I can say for the once prestige famous English bone china makers, who also make much of their wares abroad now (which is fine). But they forget to tell their customers. Whoops! That's what Mrs Thatcher used to call 'being economical with the truth'. The general rule is, if you can't see the words "made in England" clearly written on a modern piece from a famous-name English bone china quality brand, then the item most likely made in cheaper foreign lands. Remember what I was saying at the top about Walter Scott Lenox's visionary thinking and getting a group of designers, artists and artisans around him - which style of thinking catapulted the company into porcelain stardom for 123 years? Well, leave it to so called businessmen to run a company and quite the opposite often happens. That's why we have few of our old factories left in England, just the brand names. Apart from Gorham, other brands of the Lenox Corporation are Dansk, Donna Karen Lenox, Marchesa by Lenox, Kate Spade, L by Lenox. The Scalamandre collection is a new range just being launched this year.